When you’re deciding upon a shotgun, and particularly when you’re deciding between a semi-automatic and any other type of action, the primary focus should be on your intended usage. Are you going hunting, or looking to defend your home? Target shooting or collecting? Semi-automatic shotguns are perfect for sportsmen. The semi-auto is known as the “set it and forget it” option among shotgun choices, allowing the shooter to essentially forget about his ammunition once the weapon has been loaded. The semi-automatic setup allows the gun to be fired repeatedly until the magazine is empty, leaving the operator to fire multiple times in quick succession. This firing method can be very helpful when hunting large game who might not otherwise be stopped simply with even a well-shot single round. Improvements in reliability have also led to the semi-automatic shotgun frequently being used for home defense. The key to choosing a good, reliable semi-automatic for home defense is to find a high quality model. The old saying is true – you get what you pay for. Once you find a load that is well-suited to your semi-auto, and with frequent testing for reliability, you’ll soon have a trusted weapon at your side for those situations you hope never arise (but you prepare for in case they do). 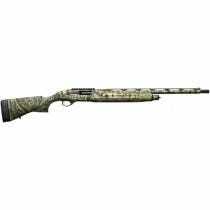 At GrabAGun.com, we have hundreds of semi-automatic shotguns in stock, including all of the top brands. If you’re not sure where to start, give us a call and we’ll be happy to help. From Browning to Beretta and everything in between, GrabAGun.com is your go-to source for your semi-automatic shotgun needs.